They were really really good. 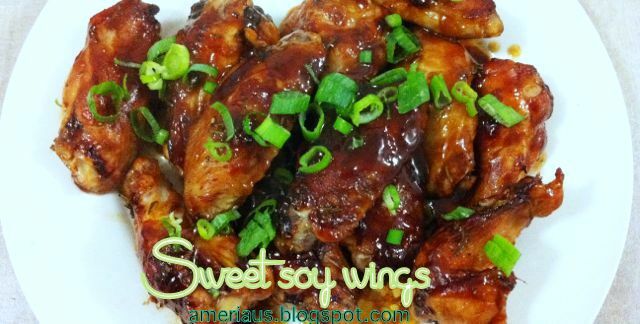 If you are a wing lover you will enjoy this quick simple marinade. The thing with marinades is that you should really make it in advance so that your meat has enough time to soak it up in the fridge for a few hours! 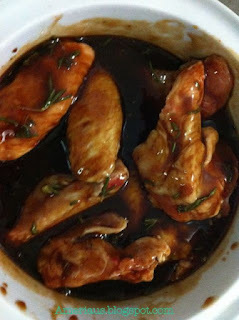 If you are impatient like me and waited to the last minute to make the marinade and only have a few hours (2 tops) for it to sit in the fridge before your hungry hubby comes home then you can do what I did. Which was sit it in the freezer! The cold helps the marinade to stick to the wings so the freezer speeds up the process. Remember to turn the wings occasionally though so it doesn’t freeze and they get immersed in the sauce. Marinades are all about taste. No specific amount of anything you need to put in. Just get it to your liking. Make sure its thick enough to stick by adding more or less tomato sauce and oyster ( or BBQ if you have it) and salty enough by adding more or less soy...sweet enough by adding more or less sweet chili and brown sugar! Mix together all ingredients until well combined in a large bowl. Place wings in bowl and toss until well coated. Place in the fridge for 4 hours ( or use the freezer tip!) Place on a lightly greased baking sheet and cook in oven until sauce starts to turn sticky and chicken is cooked! Garnish with green onion and serve warm! If you enjoyed this recipe let me know with a + and/or comment! Thanks!